Industrial barbells are longer barbells that are worn at a diagonal across the top of the ear. U.V.,GLOW & U.V. 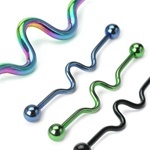 WITH GLITTER 1.5" INDUSTRIAL BARBELLS IN THE COLORS SHOWN BELOW INCLUDING PINK,CLEAR,BLACK,DARK BLUE,LIGHT BLUE,GREEN AND MORE.COMES IN BALLS AND SPIKES,INDUSTRIAL BARBELLS ARE USED FOR PIERCINGS IN THE EAR CARTILAGE FROM THE TOP OF THE EAR TO THE BOTTOM AT AN ANGLE.TOP QUALITY 316L SURGICAL STEEL 14 GAUGE 1.5"
TITANIUM ANODIZED 316L SURGICAL STEEL INDUSTRIAL BARBELLS.TOP QUALITY,INDUSTRIALS ARE USED FOR PIERCINGS IN THE EARS FROM THE TOP OF THE EAR CARTILEDGE TO THE BOTTOM AT AN ANGLE. - Ball Size: 5mm TRENDY INDUSTRIAL BARBELLS IN 14G 1.5" INCH (37MM) LENGTH WITH 5MM BALLS.COMES IN RED ROSE,CZ FLOWER,MULTI C.Z. STAR,HEART WITH WINGS,SKULL,SKULL CROSSBONES,MULTI C.Z. HEART,SOLITAIRE C.Z. HEART,SOLITAIRE C.Z. ROUND AND SOLITAIRE C.Z. STAR.TOP QUALITY 316L SURGICAL STEEL 14 GAUGE 1.5" INCH.